“Your character is not likable,” said the multi-published award-winning author after reading the first two pages of my novel. But I like him, I thought. Because I know what he is to become. God sees us as I see my character. He loves us despite us being unloveable. He knows what we can become–if we let him take charge. I will have to put some redeeming qualities in my hero(whether he likes it or not). Thankfully, knowing and trusting Jesus is all the redeeming I need for myself. 7 in order that in the coming ages he might show the incomparable riches of his grace, expressed in his kindness to us in Christ Jesus. 8 For it is by grace you have been saved, through faith —and this not from yourselves, it is the gift of God— 9 not by works, so that no one can boast. This past week I attended the Blue Ridge Mountain Christian Writers Conference. As I climbed those hills and stairs to get from one building to another, I felt like an aged person. But I must not look it. I was flattered and thought to myself, my son was born when I was 27 and he’ll be able to vote in the next presidential election. At the banquet I sat with a fellow UNC-G alumnus. I mentioned that I graduated in the 80’s (late 80’s–I never had big hair, btw). She said she wouldn’t have guessed it. What makes me seem younger than I am? Maybe it’s the extra weight that stretches out the wrinkles. But maybe I seem naive and immature to people. I would like to portray wisdom that comes with age and experience (But not with wrinkles). I don’t want to be thought of as ancient (My son thinks I am. My husband can’t, because we are the same age), but I would love to be known as wise. As a writer mentoring this miniNee writer I couldn’t refuse. So, I packed up my family(they were more than happy to comply), took a notebook and headed into town where my sister lives. Sadly, that is my horrible voice behind the camera. Notice my hesitations. I attribute those to dehydration and not old age. But it could be old age. We submitted several ideas online. Sadly, none of ours was chosen. The winners were revealed a week or so ago. But my sister’s idea should have gotten at least an honorable mention. My son was especially impressed with it. A team of mimes are in a restaurant when one of them starts to choke. Would you believe he was really choking? Would you step in to give him/her the Heimlich maneuver even if you weren’t sure? We would have many excuses for not stopping. Could have been a drug deal gone bad. It was a trap, like the police impersonator trying to lure unsuspecting people into his dangerous lair. I’m a female all alone. What could I do to help this man? I’m late for Bible study. I don’t have time to help. He’s dirty and bleeding. I don’t have my surgical gloves. What would your excuse be? Would you help? Would you be a good neighbor? I’m excited to be heading to the Blue Ridge Mountain Christian Writers Conference on Sunday. It is my most anticipated trip each year. Even above the family beach trip which I love. As I made preparations to attend I read some of the novels written by the conference staff members. I’m an early morning person which means I go to sleep early. Anything that can keep me up past 10:00 pm must be good. 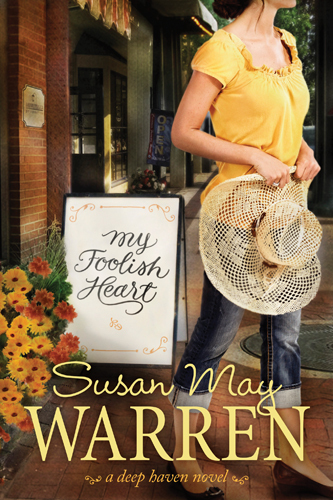 My Foolish Heart by Susan May Warren kept me up until 1:00 am and I hated myself for allowing a story to steal my sleep(which I desperately need). If you liked the movies Facing the Giants, You’ve Got Mail and Sleepless in Seattle, you just might like this story. Two broken people face their giants while they participate in a radio talk show and prepare for the big game.